Moscow is a big city boasting of over 880 square kilometers. Over the years, Moscow has grown to become a favorite for tourists who are after unique contemporary culture. Similarly, tourism is set rise exceedingly given the fact that Russia is to host the 2018 FIFA World Cup tournament. While much of the tourist attractions may be in a walking distance, plenty may be further off forcing you to utilize public transport. Moscow’s metro is arguably the best in the world. It is efficient, reliable and the most popular means of transport. It is an attraction in itself featuring a cutely designed interior with chandeliers, sculptures and stained glass windows. It is connected to 185 stations and contains 12 lines. The letter “M” is notable at the entrance, which is usually an underpass or a pavilion in some cases. In order to enter you have to have a ticket, which can be obtained from a ticket machine or a ticket office. After getting your ticket, put it on the right side of a turnstile, on the yellow circle until you see a green light. Price for every ticket is dependent on the number of rides you would like to take. If you have a Troika card you can use it. The good thing about the Troika card is that the more rides you want the cheaper they will be. Additionally, Moscow Metro opens at 5.30 am running to 1 am. There are no maps or timetables available to passengers although trains are frequent. In case you have trouble with anything, you can approach an emergency column within the station. Moscow Central Circle features a 54 km long railway line that was opened back in 2016. The MCC will definitely turn your trip into an amazing tour having been integrated with all transport networks in the city such as the metro. It is 100% above ground offering you a free sight of the city. As a railway network, it grants pedestrians more access to other cities within Russia and has helped to ease congestion at the metro. Another remarkable thing about the MCC is that it is fast, with trains travelling on both direction of the circle line run after every 5-10 minutes. Furthermore, it opens at 5.30 am and closes at 1am for maintenance. Tickets are available at every station and all you have to do is to get to any ticket shop and approach the cashiers. Lately, the city now features standard fare passes for the city such as Troika cards, 90 minute cards and multi-fare tickets. Troika cards can be bought from the train station and you can load it with money at any pay-terminal. Trams are also a good option for transportation in Moscow. They are interesting though only a few routes are still operating within the city. However, they offer a good view f the city and you can spend the weekend riding with them on a sightseeing trip. The tickets for riding trams are obtained from the driver or ticket kiosks. Troika cards could also be used in this case. The Marshrutka is basically a Russian version of a taxi falling somewhere between a bus and a private car. Marshrutkas are known to conduct most of the tours in Russia because they are smaller and less crowded compared to buses. Before getting on the Marshrutka, you have to have a Russian translator or be conversant with the Russian language since the drivers do not speak English. The prices for the taxi depend on the part of the city or route. Tickets are not necessary in this case. You deal directly with the driver. 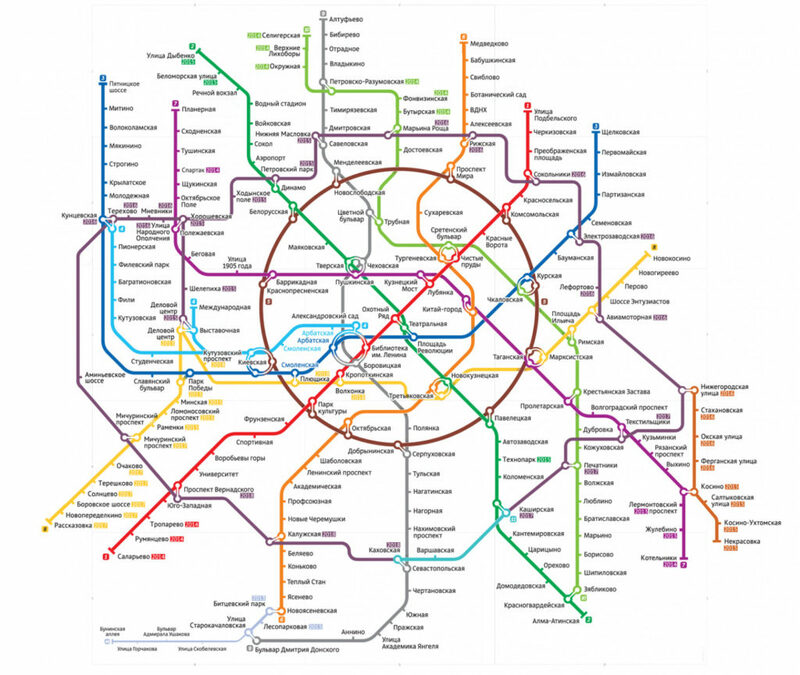 Besides metro, buses and trolleybuses will also help you move around Moscow conveniently. At least one bust route serves every major street within the street, though is always good to know the right one to use. The bus and trolleybus system work almost in a similar manner. The operation time is normally between 5.30 am and 1 pm. For the tickets, you can buy them from the bus driver or a bus ticket kiosk at the bus stop. Price of the ticket will also depend on the number of rides. In the event that you are using a Troika card the each ride will only cost 35 roubles making it cheaper that when tickets are used. Every bus stop has a schedule for the bus operating on that route. To get on a bus or a trolleybus insert the ticket into the turnstile’s validator and pass after the green light shows. After you arrive at your destination, signal the driver to stop by pushing the button near the exit door. Now that you are familiar with the means of transport, I hope you will have a good time in Moscow. Enjoy!